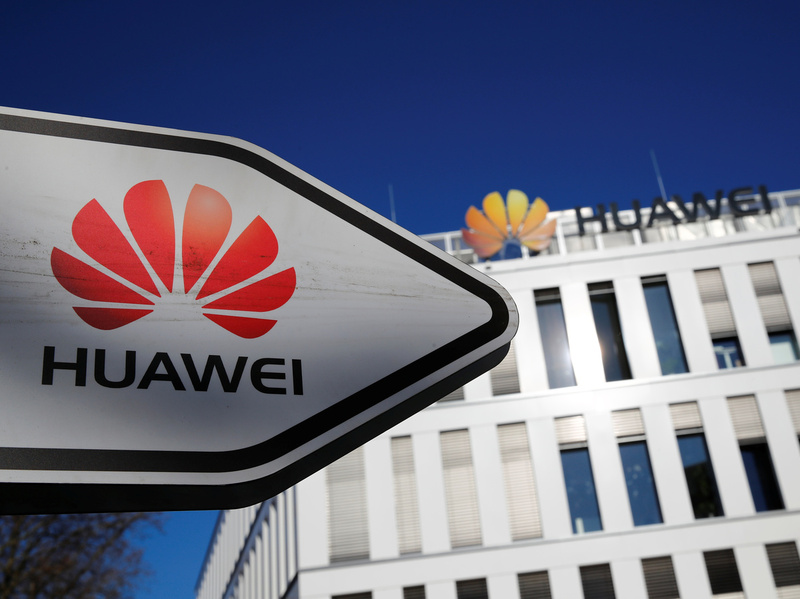 Despite U.S. Pressure, Germany Refuses To Exclude Huawei's 5G Technology The U.S. says it may stop sharing intelligence with Germany if it adopts Chinese firm Huawei's 5G technology. But the threats haven't swayed Germany, which says it can set its own security standards. The German headquarters of Chinese telecommunications giant Huawei in Duesseldorf, Germany. The U.S. says it may stop sharing intelligence with Germany if it adopts Huawei's 5G technology. The race to build the next generation of super-fast mobile-data networks has begun in Germany, which started auctioning off its spectrum licenses for 5G on Tuesday. But this highly technical event has become the center of a geopolitical storm between the U.S. and China, with Europe caught in the middle. Germany has refused to ban any company, despite pressure from the U.S. Instead, Chancellor Angela Merkel reiterated that her country would instead tighten security rules. "Our approach is not to simply exclude one company or one actor," she told a conference in Berlin on Tuesday, "but rather we have requirements of the competitors for this 5G technology." "But you never know what happens in the future," he says. "Every technology is software-based. So if there's an update, you can change the whole concept. ... So it's about [having] a plan on how to ensure the whole network." Huawei strongly denies U.S. charges that it spies and is too cozy with the Chinese government. The company is working hard to win Germany's trust. It even opened a lab in Bonn where security officials can check its products. "The idea of this lab is that the responsible IT security authority of Germany but also other interested parties like independent auditors or our customers could go to that lab," says Huawei Germany spokesman Patrick Berger, "and, for example, verify our source codes and see that there are no malicious things in our codes." But policymakers and analysts in Germany acknowledge that this debate isn't just about network security. It's a geopolitical confrontation between two superpowers with strong ties to the European Union. "When we see this confrontation, it's important for states in Europe to avoid being forced to take sides in this kind of conflict the way it's structured now, by these two superpowers," says Daniel Voelsen, a researcher at the the German Institute for International and Security Affairs in Berlin. "Instead, Europe should focus on what Europe's own interests are here, especially in terms of national security but also economically," he says. "And then on the basis of that assessment Europe should shape its relationships with China and the U.S. in ways that serve our European interests." And it's not unusual for governments to spy, says Frank Pieke, director of the Mercator Institute for China Studies in Berlin. "It's done by the American government, it's done by the British government, so that the Chinese can do this and might do this is also in and of itself not an indictment of China or an indictment of Huawei," he says. But, he adds, "in Western democracies the work of a security apparatus is in principle subject to the rule of law and under control of the democratic political system. And these guarantees you don't have in China." Pieke says he sympathizes with what the U.S. is saying about its concerns with Huawei. But, like others in Germany, he's displeased about the way it's being said. "They say basically, 'If you're not with us, you're against us,' which is an age-old trick of course in the book of escalation," Pieke says. "It's an indication that the current U.S. administration is absolutely not interested in any form of discussion or dialogue. They basically want to ram their ideas and their assessments down the throats of everybody else in Europe." Meanwhile, Germany continues to push on with its 5G auction and not only because it wants to improve its famously slow data speed. BMW and other carmakers want to use 5G's much faster data speeds to operate self-driving cars. At the BMW Museum in Munich, a video shows a driverless car dropping off a passenger in front of a building. "I will be back here and pick you up at 11," the car tells him. "If you go to a meeting, you go with your car, you leave the car in front of the office," says BMW tour guide Jan Opalka, explaining the video. "And the car is going, you can see it now ... [it's] driving around the block and it's coming back [on] time." Driverless cars need a super-fast network to communicate with traffic lights, with each other and with sensors that alert them to jaywalkers. Peter Beyer, a member of Merkel's cabinet who is in charge of transatlantic relations, brought up self-driving cars in a statement intended to placate the U.S. He said the U.S. was bringing up "justified doubts" about the Chinese but added: "It is self-evident that we will reach all decisions independently and responsibly in line with our interests, also vis-a-vis our partners."